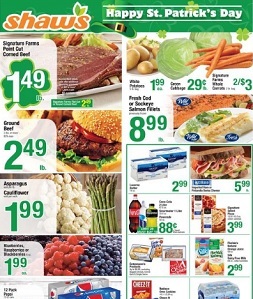 Latest savings from Shaw’s, valid 3/16 – 3/22/2018: $1.49 lb Signature Farms Point Cut Corned Beef; $2.49 lb Ground Beef; $1.99 Asparagus sold per lb. Cauliflower sold per each; $1.99 Blueberries, Raspberries or Blackberries; $1.99 White Potatoes; $.29 lb Green Cabbage; 2/$3 Signature Farms Whole Carrots; $8.99 lb Fresh Cod or Sockeye Salmon Fillets; $2.99 Lucerne Butter; $1.99 Refreshe Water; $2.99 Florida’s Natural Orange Juice; $.88 Siggi’s Icelandic Style Skyr Yogurt or Open Nature Greek Yogurt; $10.99 Tide Laundry Detergent 92-100 oz. Tide Pods 42 ct.; $1.88 Kraft Salad Dressings; $6.99 lb Lamb Loin Chops; $1.49 lb Signature Farms Chicken Drumsticks, Bone-in Thighs or Whole Fryers; $9.99 lb Salmon Fillets; $7.99 lb Skinless Haddock Fillets; $2.99 O Organics or Signature Cafe Hummus; $8.99 7” Store Made St. Patrick’s Day Cake; and more.